Fire suppression systems include the installation designed to provide fire protection for hoods, ducts and restaurant cooking appliances. We carry a full line of system parts and components to inspect, recharge, and service every type of fire suppression system. 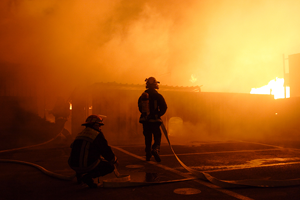 Our services are in accordance with the National Fire Protection Associations (NFPA) standards 17, 17A and 96. All kitchen hood systems are required by NFPA code to be inspected Semi-Annually.